As a young boy, reading late at night with a flashlight under the covers, I reveled in stories of darkness and light. As a journalist and teacher, I continue to search for stories in the shadows, revealing everyday philosophy and wisdom hidden in people and places that are too often overlooked. As a young newspaper reporter, I specialized in narrative obituaries of people whose names had never before appeared in the newspaper, but whose stories were often more fascinating than any celebrity or politician. Those lives and the lessons they taught (collected in my first book,Obit), largely guided my coverage of the war in Iraq, which began in 2003 with the first casualty from Colorado and continued as I followed a U.S. Marine Casualty Assistance Calls Officer and the families he touched while saddled with one of the most difficult duties in the military. 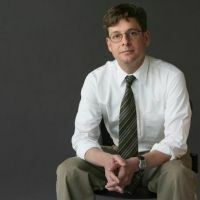 That coverage led to a 12,000 word newspaper story that won the 2006 Pulitzer Prize for Feature Writing, and later a book, Final Salute, which was a finalist for the 2008 National Book Award in nonfiction. As the Shirley Wormser Professor of Journalism and Media Writing, I’m handing off the flashlight to students, teaching them to find hidden stories. In that search, they’ll use traditional reporting tools – a pen, a notebook and heaps of curiosity – but classes will also use digital techniques including audio, video and still photography on the Web. Whichever medium they choose for publication, I expect my students’ work to remain rooted in a simple request that hasn’t changed for centuries: tell me a story. He will be giving a talk titled “Shining a Light on Hidden Stories”.